Black field numbers correspond with the house numbers. Red numbers are parcel and lot numbers. Small green plots with black dots are vegetable gardens. Larger green plots with drawn trees are orchards. The tan areas are fields, the dark gray is probably timber, and the blue, water. The language on the plat is a combination of German and Czech. German cursive was used but Czech diacritical marks appear in Czech spellings and some Czech words were included. Field no.13 is marked Pekarek (Pegorick) Georg und Anna. Georg is German for Czech Jiri (George); und is German for the Czech a (and). They Germanized Vozenilek to Wozenilek but used the Czech hacek over the z. German Johann is used for the Czech Jan (John), etc. G.W., up and left of the red A probably is an abbreviation for Gemeinde Wiese (community meadow). South of town, the large vertical green strip says Dzbanov Gemeind W. (probably Wiese and more meadow). The largest pond Dworskey n. Teich = pond of the court/courtyard. The court refers to the land-owning nobles and royals. 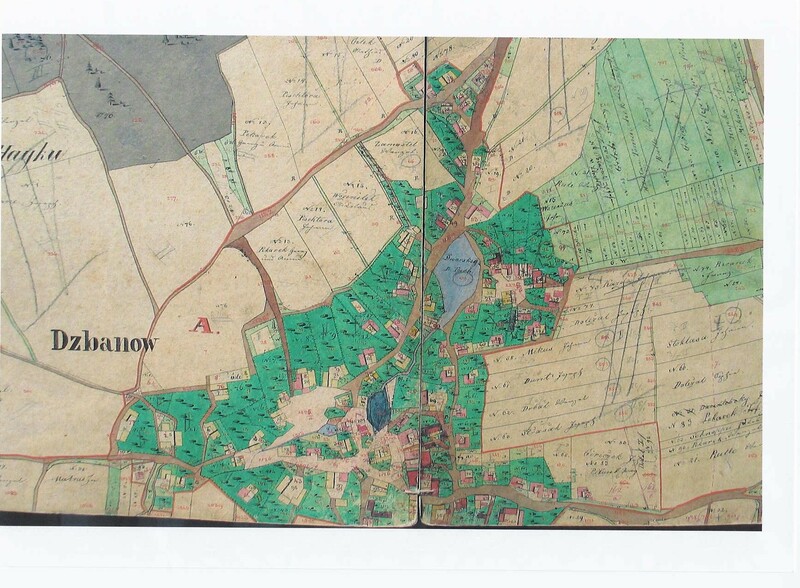 There might have been a noble’s manor house in the village though none is marked. No church or chapel is indicated but might exist. Ode, between the red A and #76, means waste/empty. Left side of the page shows the “city limits” with neighboring towns indicated. Lhutta/Lhuta to the northwest is the origin of the Oxford Jct. Peckosh (Pekar) family. Right side (Parzellen Ausweis) says Parcel Lots, explaining the land use (?) for 1349 units of land, perhaps lans but they seem to corresspond with the red parcel numbers. A = Dzbanov town, B = at Haiku (timber), C = upper Blahov (? ), D = on/in Leksynach (possibly at rest, in fallow), E = below/under Hattema (?). Weege = probably the German weg for way as the corresponding numbers are on the roads and paths. Fluhse = probably the German Fluss for rivers and streams as the canal to the left of the smaller pond has a red 1215 on it. Bauarea = probably means the buildings. There seems to be 99 houses. Untergetheitle = under divided (disputed? the church?). Sum/total 1349. Little variation in given names is seen. Johann (Jan/John), Joseph (Josef), Georg (Jiri/George), and Wenzel (Vaclav,Wenceslaus) the most common. The surnames that we recognize in Oxford Junction are Beranek, Dolezal, Pekarek (Pegorick), Wozenilek (Vozenilek), Jilek, and Zamastil, Lacina, Stoklasa (married Balichek), and Rule/Rulle if that is Rula/Ruley. Oxford’s Jilek was from #78 which is close to the Jilek field on this plat. Oxford’s Beraneks were from #48 and 69. The Franz Beranek on this plat (extreme right of the A page, just under the road) is #74, connection to Oxford unknown but Franz is an ancestor of the current mayor of Dzbanov, Jindrich Svatos. 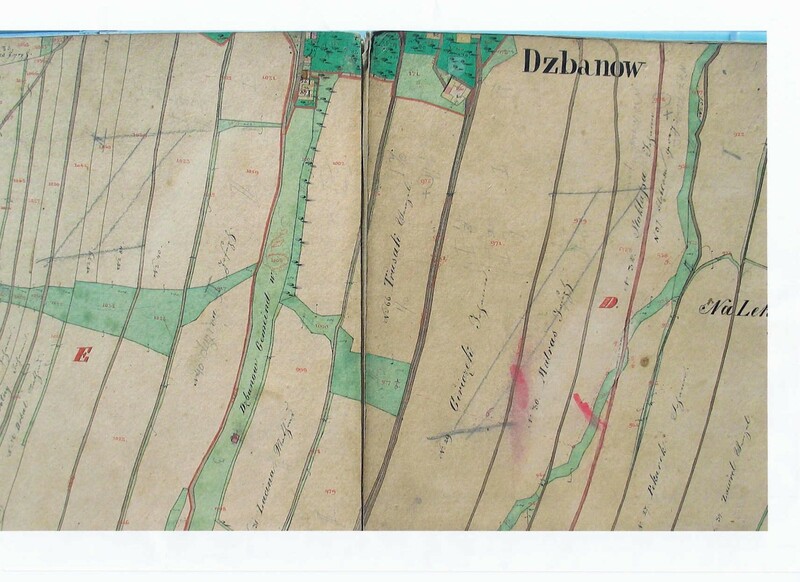 The Beraneks came from nearby Vanice, moving to Dzbanov between 1695 and 1735. Oxford’s Vozenilek was from #15, on here owned by Mikolaus (Nicholas) the ancestor of the emigrant twins John and Joe. Notice that the Zamastils were close neighbors of the Vozenileks….Joseph Zamastil and the twin Joe (and their families) emigrated in 1870, perhaps coming together. The twin John came the previous year with his young family. Pekarek became Pegorick in Oxford Township and obituaries reveal their Dzbanov origin. Oxford’s Dolezals came from here and two Dolezals are on this plat.